It’s true: This is the most wonderful time of the year. The holidays remind us to appreciate all we have and to celebrate with our family, feasts … and films. 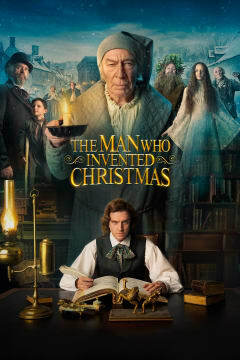 To get into the festive spirit this season, start with the modern twist on a timeless tale, THE MAN WHO INVENTED CHRISTMAS. In October 1843, Charles Dickens (Dan Stevens) was suffering from the failure of his last three books. Rejected by his publishers, he set out to write and self-publish a book he hoped would keep his family afloat and revive his career — in the six, fever-pitched weeks leading up to Christmas. THE MAN WHO INVENTED CHRISTMAS tells the magical journey that led to the creation of Ebenezer Scrooge (Christopher Plummer), Tiny Tim and other classic characters from “A Christmas Carol.” We are invited into Dickens’s creative process, as he combines real-life inspirations with his vivid imagination to conjure up an unforgettable story — and to forever change the holiday into the merry family event we know today. During this time period, Christmas was not commemorated with gifts and good cheer. The “Hungry Forties” ushered in an era of poverty and unemployment; industrialization forced children to work in factories to help support their families, including Dickens. Additionally, Parliament enacted a law in 1644 that stated December 25 be a day of fasting and penance, and England followed this rule for more than 200 years. Needless to say, a novel about Christmas was a risky idea, especially to self-fund when Dickens was already facing financial difficulties; however, the struggling writer was certain his message would transform society and be his greatest work. He was right. Still today, “A Christmas Carol” is one of the holiday’s best-loved stories, and THE MAN WHO INVENTED CHRISTMAS preserves the book’s charm and whimsy. The characters come alive, like the three spirits, as Dickens talks aloud “with” them in his study (and in the streets) to find their voices — mostly, with the old miser. Stevens’s Dickens often comes across as manic, while Plummer’s Scrooge is more somber than cross. 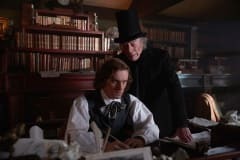 Throughout the film, Scrooge seems to serve as Dickens’s conscience, forcing the author to face his own haunting experiences through his character. In the end, they both make peace with their pasts and make amends to those they’ve wronged. Directed by Bharat Nalluri and adopted from Les Standifordas’s book of the same name, THE MAN WHO INVENTED CHRISTMAS opens this Thanksgiving. Fill up on your favorite dishes, and then bring the whole family to AMC to kick off Christmas. Get your tickets online or your local theatre today.